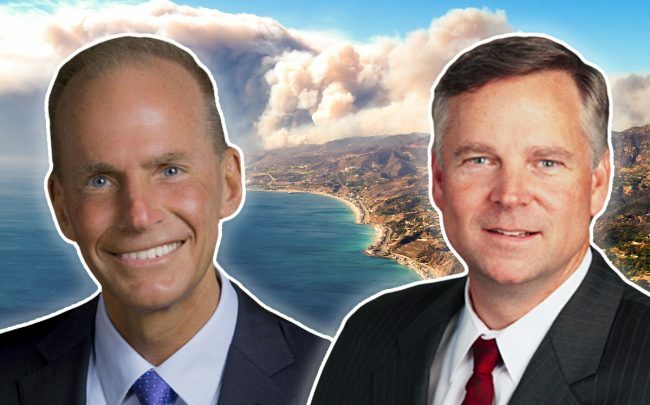 More than 100 property owners and renters are suing Southern California Edison and aerospace giant Boeing following the deadly Woolsey Fire, which caused an estimated billions of dollars in real estate damage. The lawsuit alleges the two companies’ failure to maintain vital infrastructure contributed to the November blaze, according to the Los Angeles Times. The Woolsey Fire killed four people and caused more than $5 billion in property damages when it ravaged northwest L.A. County and Ventura County. The fire started near Boeing’s Santa Susana Field Lab and the utility’s Chatsworth electrical substation. The filing accuses Boeing of failing to have an adequate fire prevention program, enough firefighters to respond and sufficient equipment to stop the blaze before it spread. The suit is at least the third leveled against Edison and appears to be the first against Boeing related to the Woolsey Fire. A lawsuit filed last week against the utility was brought by a Malibu winery owner and two homeowners, who allege Edison kept electrical equipment running during a period of strong Santa Ana winds just before the fire. In December, a group of 170 homeowners sued the utility, claiming the fire started from its overhead electrical equipment at the Rocketdyne facility in Simi Valley. Edison, which supplies power to 15 million customers, is the state’s second largest utilities company behind Pacific Gas & Electric. The recent suits are nearly identical to ones filed against PG&E for its part its part in devastating California wildfires over the last several years. Those suits open PG&E up to $30 billion in potential liabilities, which prompted the company to file for bankruptcy in January.